The southern gateway to South Australia’s iconic Heysen Trail is located at Cape Jervis. The opening section of the Trail runs adjacent to the coast for approximately 10 kilometres before ascending to the Deep Creek Conservation Park at Blowhole Beach. Along this section walkers experience magnificent views across Backstairs Passage to Kangaroo Island, access to small rocky coves and patches of native scrub. Significant flora include Eucalyptus porosa and Melaleuca lanceolata. Birds of conservation significance are the Hooded Plover (Thinornis rubricollis), Eastern Reef Egret (Egretta sacra) and the Elegant Parrot (Neophema rubricollis). Unfortunately, it is also the case that the coastal strip is severely degraded due to soil erosion, the activity of off-road vehicles and infestation by invasive plant species. There is a need to remediate this area to provide an attractive and welcoming experience for walkers that highlights the natural attributes of this area. The Southern Fleurieu Coastal Action Plan and Conservation Priority Study, 2007 concluded that the beaches and lower slopes of Cape Jervis, Lands End and Fishery Beach were areas of high conservation value and were also facing a high level of threat. It was identified that the area from Deep Creek CP to Morgans Beach (to the north of Cape Jervis) includes coastal reserves that have been successfully improved by community groups. Actions that would improve connection between vegetation blocks would greatly enhance the value of the area. The section between Cape Jervis and Fishery Beach is the responsibility of a number of land management agencies including the District Council of Yankalilla, the Coastal Protection Board, community organisations and private land holders. The Council, under the auspices of its Coastal, Estuary and Marine Officer Corey Jackson and others, has made significant improvements including the establishment of an environmental hotspot between Lands End and Fishery Beach. 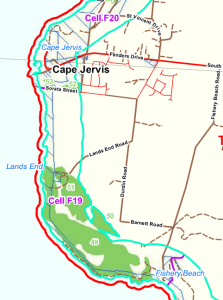 The gateway section is managed by the Council and the initial section from Cape Jervis to Lands End is managed by the Coastal Protection Board. Maintenance and re-vegetation activities have also been undertaken by group of dedicated volunteers led by Dr Carolyn Schultz, the Cape Jervis Coastal Community Group. COOTS (Conservation of our Threatened Species) a subgroup of the Australia Plant Society, manage the public lands just inland from the Heysen Trail, between Lands End and Fishery Beach. The Warren Bonython Heysen Trail Foundation has identified the Heysen Trail gateway at Cape Jervis as a focus for greening activity and will allocate volunteer resources and grant funding, where successful, to facilitate this activity. If you are interested in further information please contact Richard Trembath on 0438 762 122 or info@WBHeysenTrailFoundation.org.au. This entry was posted in Environmental work, General News. Bookmark the permalink. The annual general meeting of the Warren Bonython Heysen Trail Foundation will be held at 5.00 pm on Wednesday, 17th of October 2018 in the Board Room, Uniting Communities, 10 Pitt Street, Adelaide. Members can appoint a proxy by completing the Proxy Form which can be accessed by clicking the link below. IF you are interested in becoming a Director of the Warren Bonython Heysen Trail Foundation you may also nominate via the online form. Nominations are accepted at the discretion of the Board. If you wish to nominate please respond by the 10th of October 2018. Please click the link below. Experience local parks and native scrub and have fun while supporting the Warren Bonython Heysen Trail Foundation’s 2018 fundraising efforts. The foundation supports the improvement of facilities and the environment on the Heysen Trail & other walking trails. Four walk options from 5km to 17km. Walks depart from 9.00 am. Arrive in time to register before your walk. All walks depart from and arrive back to the Bridgewater Oval. Walks are designed to suit all ages and standards of walking fitness. Bring the family for a great day out in the Adelaide Hills. After the walk grab a BBQ meal (included in registration fee) at the Bridgewater Oval, or bring your own picnic. The picnic area includes the football club rooms, toilets and parking. 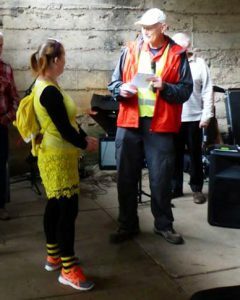 In keeping with the tradition of the Warren Bonython Memorial Walk conducted by the Friends of the Heysen Trail in 2013 the theme for the day will be yellow. A prize consisting of a Heysen Trail merchandise pack (value $100) is up for grabs to the best yellow sartorial costuming on the day. Experience the pine forest and native scrub and have fun while supporting the Warren Bonython Heysen Trail Foundation’s 2017 fundraising efforts. The foundation supports the improvement of facilities and the environment on the Heysen Trail & other walking trails. Walks depart from 9.30 am. Arrive in time to register before your walk. All walks depart from and arrive back to the Fromm’s Farm picnic area. Walks are designed to suit all ages and standards of walking fitness. Bring the family for a great day out at Mount Crawford. After the walk grab a sausage off the BBQ at the Fromm’s Farm picnic area, or bring your own picnic while enjoying some cool blues with “The Bluesers”. The picnic area features a larger shelter shed, picnic tables, toilets and parking. A prize consisting of a Heysen Trail merchandise pack (value $100) is up for grabs to the best sartorial contribution on the day. Support the Foundation by making a donation. The Foundation is a registered environmental charity and donations are tax deductible. 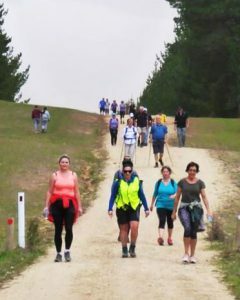 The Foundation was established with the objective of raising funds to support the sustainability and integrity of the Heysen Trail and other walking trails in South Australia. Over the last two years, the Foundation has supported greening activities along the Heysen Trail. In coming years, the aim is to extend the Foundation’s involvement in tree planting on other walking trails and activities such as improvements to infrastructure which protect the environment by reducing the impact of the trail in sensitive areas. Working with volunteers from the Friends of the Heysen Trail, the Foundation has financed the planting of 750 trees along the Heysen Trail at Dutton’s Trough near Worlds End south of Burra. Walkers familiar with the Heysen trail will be aware that this is a particularly barren section of the trail and desperately in need of some shade or shelter. However, as it is on Goyder’s Line, it is also a challenging area to grow trees. This has meant that the Foundation has financed several supplementary waterings to encourage the trees to thrive. 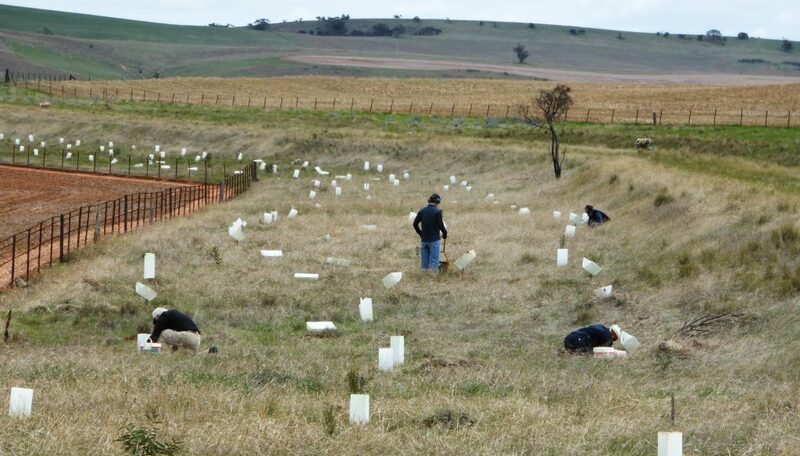 The Foundation has also financed the planting of 600 trees along the Bundaleer Channel where the Heysen Trail crosses Railway Dam Road east of Spalding. 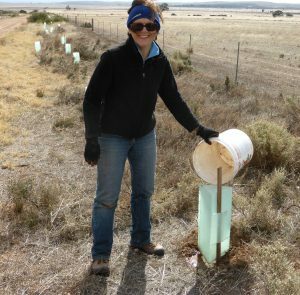 Once again the work has been undertaken by volunteers from the Friends of the Heysen Trail and it follows from a previous tree planting at that site. The plantation has progressed to the stage where there is the semblance of a forest which warranted the clean-up of the site with the removal of guards and stakes. In the coming year, the Foundation is expected to finance work to better protect trees planted by the Friends of the Heysen Trail around Hiskey’s Hut, west of Georgetown. And negotiations are underway to assist in greening the Lavender Trail with tree planting along the trail near Point Pass. The Foundation continues to search for other opportunities to improve the environment of walking trails in South Australia and welcomes any suggestions of necessary works. This entry was posted in Environmental work. Bookmark the permalink. 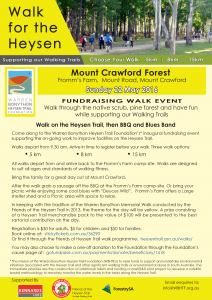 The Warren Bonython Heysen Trail Foundation held its first fund raising event on the 22nd of May 2016 in Mt Crawford Forest. Featuring a number of walk options, blues band ‘Deuces Wild’ and a BBQ, the event was well attended and raised over $3,000 for the Foundation. The event will be held again in 2017 to raise awareness of the Foundation and the Heysen Trail in addition to raising funds. Thanks to Robert Alcock, the Friends of the Heysen Trail walk committee and numerous others for their help on the day. After an extensive application process the Warren Bonython Heysen Trail Foundation and its public fund were entered onto the Register of Environmental Organisations effective from the 27th April 2016. The Foundation has received endorsement by the Australian Taxation Office as a Deductable Gift Recipient (DGR). Donations made to the Foundations public fund from this date may be eligible for a tax deduction. Please join us for the Foundation’s inaugural fund raising event. Proceeds of the Foundation’s fund raising activities are currently used to support greening activities along the Heysen Trail and the restoration of fire damaged sections of the Trail. All walks depart from and arrive back to the Fromm’s Farm camp-site. Walks are designed to suit all ages and standards of walking fitness. 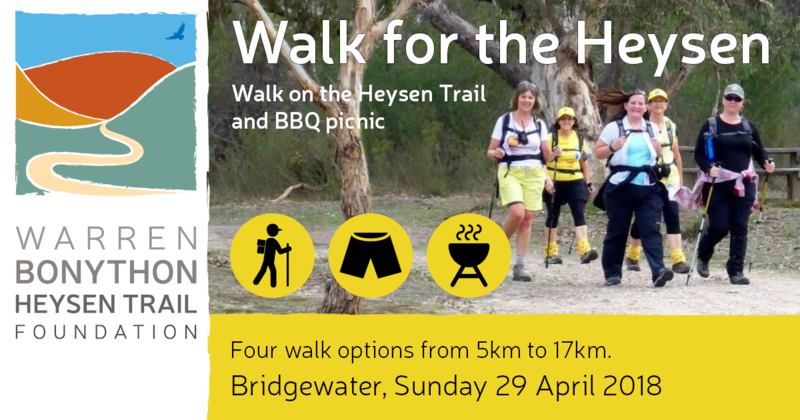 In keeping with the tradition of the Walk for Warren established by Friends of the Heysen Trail, the theme for the day will be yellow and a prize consisting of a Heysen Trail merchandise pack to the value of $100 will offered for the best sartorial contribution on the day. After the walk grab a sausage off the BBQ at the Fromm’s Farm camp-site. Or bring your picnic while enjoying some cool blues with “Deuces Wild”. Fromm’s Farm offers a Large shelter shed and a Picnic area with space to relax. The cost of registration is $30 for adults, $5 for children and $50 for families. Please note that the Foundation’s application to be registered as an environmental charity is still pending and donations at this point in time are unfortunately not tax deductible. 3% of recreational daytrips undertaken in South Australia over the period 2012-2014 involved ‘bushwalking / rainforest walks’ as an activity. This equates to 347,000 daytrips over an average 12 month period. Average daytrip expenditure in regional SA in the year ending June 2015 was $96 per trip. This equates to total expenditure of $33.3 million by day trip visitors that bushwalk. 10% of all overnight domestic visitors to South Australia participate in ‘bushwalking / rainforest walks’ as a component of their visit. This represents around 527,000 visitors annually over the period 2012-2014. The average expenditure in regional SA by domestic overnight visitors was around $430 per visitor in the year ending June 2015. This equates to a total expenditure of $226.4 million by overnight visitors that bushwalk. More than one third (38%) of international visitors to SA participate in ‘bushwalking / rainforest walks’ as a component of their trip to Australia. While this activity may not necessarily occur in SA it represents an average of 138,000 visitors over the period 2012-14. The average length of stay by holiday / VFR purpose international visitors to SA was 16 nights over the period 2012-14 while the average spend per night in regional SA in the year ended June 2015 was $86. This suggests expenditure by international visitors to SA who bushwalk as a component of their trip of around $189.9 million. The estimated expenditure made by daytrip and overnight visitor in SA who bushwalk is summarised below. The total annual visitor expenditure for all overnight visitors over the 2012-14 reference period was $5,100 million and expenditure by overnight visitors who bushwalk represents around 8% of total overnight visitor expenditures for the State. While not all of the expenditure can be attributed to the direct influence of bushwalking as an activity (in most cases walking will be an ancillary activity) the data demonstrates the importance of bushwalking as a component of the benefits sought by visitors and suggests that walking should be prominently positioned within a broader nature based tourism strategy. It is anticipated that significant infrastructure such as the Heysen Trail will be recognised and appropriately supported through tourism product development under the State’s nature based tourism strategy. What are the characteristics of walkers in South Australia? What are the key motivations for walkers in South Australia? What trails / regions are most attractive? Why? What is the economic impact of walking in regions? What is the value of tourism based on those visitors who travel primarily to walk? What should be the product development priorities to attract more visitors interested in walking? This article originally appeared on Greenhill Research and Planning’s blog and is reproduced here with permission. Tourism Research Australia. Travel by Australians. International Visitors in Australia. SA Tourism Commission. South Australian Tourism Profile. Daytrip is defined as: Non routine round trip of at least 50 KMs and 4 hours away from home. Subscribe to receive regular updates of our activities and invitations to the Foundation’s events and functions.